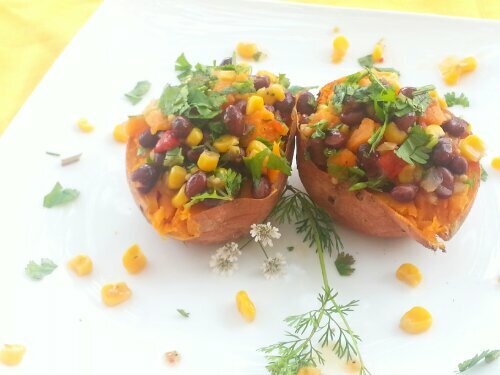 Baked sweet potato with corn and black bean salad. Lately, my favorite lunch has been baked sweet potato with corn and black bean salad; not only is it quick, easy, and delicious, but it is a nutritional powerhouse to boot. Sweet potato is packed with vitamins A, C, B5, and B6 as well as manganese, tryptophan, potassium, copper and fiber. Beans are great, as they keep your colon healthy and lower risk of type II diabetes and a plethora of cardiovascular diseases. The onions, jalapeno peppers, cilantro, parsley, spices, and olive oil are equally great for you. I absolutely love the combination of flavors in this dish, and eat it at work at least twice a week. I normally make the salad the night before and bake the sweet potatoes in the morning while my kids are getting ready for school. In the summer, I like to add grilled corn and fresh picked herbs to add a wonderful flavor to my dish. However, these are not the only ways you can make this dish. If you want, you can also add cherry tomatoes, bell peppers, avocado, or anything else that might mesh well with the other ingredients. However, the combinations I shared with you are some of my favorites. Toss the rest of the ingredients in a bowl. Such a colorful, delicious beauty on a plate!